It’s summer, and do you find yourself stepping outside to do some outdoor activity and a stomach-grumbling, appetite stimulating, scent wafts your way from somewhere in the neighborhood? Yep, that’s probably me, taking full advantage of the weather and getting my grill on! Are you ready to get grilling this summer and you just need a few great grilling tips?Grilling is my ultimate favorite summertime dinner activity. Around here, it’s a way to get the whole family outside more often, as they run and play while I lovingly turn chicken, or arrange veggie-loaded kabobs, or place fresh-soaked cedar planks loaded with delicious fish over the hot burners. I’m not sure what I love more, the scent of charring deliciousness, or the fact that I’m not standing, sweating over a hot stove during the hottest time of the year. There’s virtually no clean-up, and with the amount of cooking I do around this house with four kids, a hungry man and my own grown-up appetite, that’s important too! I’ve discovered that just about everything edible known to man can be grilled, or roasted on a grill, or steamed in a foil packet, or slipped lovingly onto a skewer, or in SOME way, grilled! Fruit, veggies, chicken, fish, seafood, lean meats, breads, and even lemons and spice bunches! It’s all game for the grill, it just takes imagination and inventiveness with those cast iron plates! While I am by no means the top grill-expert (but alas, that title still belongs to the great Bobby Flay!) I have tried my hand at many a dish involving the trusty old grill, and I’ve gathered some great ideas over the years. So here are some of my top tips for making this summer a grillin’ success in your own backyard! 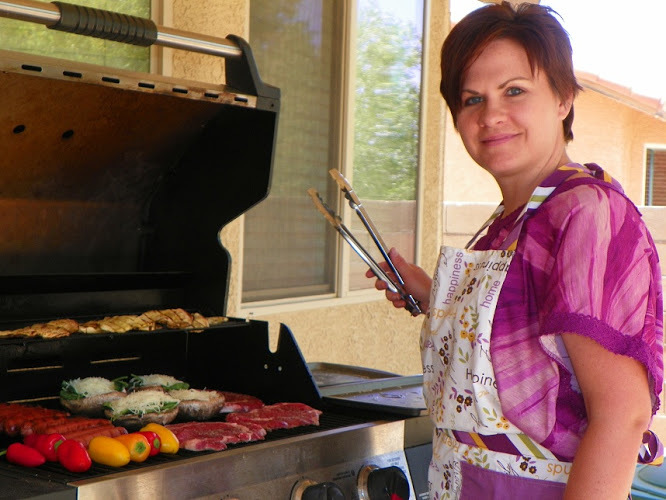 Use a gas grill – It’s mess-free, and much easier to manage the temperature as you cook your food. If you prefer the scent of a charcoal grill, just add the cedar chip tray to give your food the desired smoky flavor. Start small, start easy – If you are new at it, start with easy dishes, like chicken tenders or hamburgers to learn temperatures and timing. As your confidence grows, add new dishes, like grilled veggies and steaks. It’s smarter to learn how to grill with something lower cost and easy than the hard way with a $15 steak! Mind the grill – While you are gaining your grilling medals, be sure to stay close to the grill, and check your food often (though you only need to touch or turn it once!) It’s not fun to get caught up doing something else and forget about the salmon, creating petrified dinner! Think outside the grill – You’d be surprised what you can grill, or how you can combine different food groups, and still achieve deliciousness! Fruit with veggies, veggies with fish, citrus with fish, chicken with fruit, the list goes on! I’ve even seen grilled salad in some new recipes! Keep it fun, make it inventive, and your family will stay full – and in such a healthy way – with your grilling skills this summer! Let’s get grillin’ together! Share your pics, recipes, ideas and experiences with me on my Facebook page, Coach Bess, or in our free community, as I bring you grilling info all summer long!